Hanuman said, "O Lord of my Life. It is impossible to describe. Sita is reduced to bones, for she does not take food nor does she sleep. She is counting every minute praying for your Darsan. She has no other thought than the recitation of your name. She wanted me to inform you of her countless prostrations. She remembered Lakshmana often and shed profuse tears. The sharp verbal dagger-thrusts that Ravana administers every morning and evening when he comes to her and speaks to her, I have heard with my own ears. Mother does not listen to his prattle in the least; she is ever melting away in the agony of separation and in thoughts centered on you." "Save Sita this very moment! ", cried Hanuman falling at the feet of Rama. Hearing these words, Lakshmana rose in vengeful anger and wept at Sita's condition. The picture of Sita in Lanka burnt his inner being. He said at last, "Brother! Do not delay. Save my sister-in-law!" Rama replied with a smile, "Lakshmana! Do not hurry. Bide your time. There is a time when each step has to be taken. Do not be dejected when grief invades or exults when joy flows in." Rama consoled him with soft and soothing words. 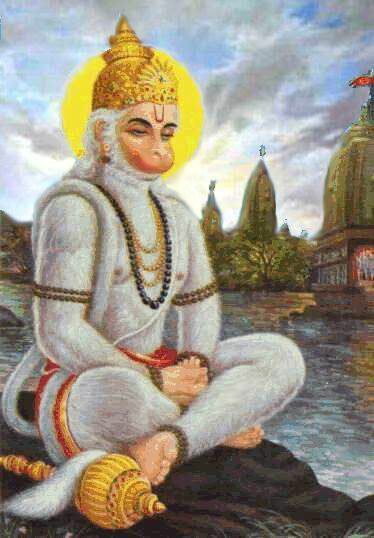 Then he called Hanuman near, and invited him to sit close to him. He seated him near his feet. He asked him, "Hanuman! What is the nature of the rule that Ravana has established in Lanka? How did you set Lanka on fire?" Hanuman said, "Lord! There is nothing you do not know. What shall I say of the strength of monkeys! We are only animals that jump about from branch to branch. How can we jump from one shore of the sea to the other? How can we overpower the Rakshasas? How can we destroy the City of Lanka through fire? All these were due solely to your Grace and Glory. The strength and courage that your Name confers helped us to achieve those things. I am absolutely unable by myself to do anything. The Ring of yours that I had with me guarded me and guided me aright. Lord! Seeing the Ring and holding it in her hand, how happy was Mother! 'Is this a dream? Or, was it really sent by Rama to me?' She wondered Thus, doubted thus, and finally became firm in faith, Lord. Her grief, the extreme anguish of hers, they set fire to Lanka and destroyed it, not I. You chose me as an instrument and you achieved these great tasks with me as a tool. All this is a blessing bestowed on me, since you have great affection towards devotees. Lord! Nothing is impossible for one who has won your Grace". When Rama heard these words steeped in sincerity and humility, he was very pleased. He turned to Lakshmana and said, "Brother! Prepare for the campaign, without delay". And, watching the earthshaking forces that were gathered and the preparations that Jambuvan and Sugriva made, quite soon, the Gods themselves were astounded, and gratified. The monkey warriors touched the feet of Rama and raised a triumphal roar. Rama blessed them all by his glance of compassion and benediction. Each warrior became a mountain peak that had grown wings! And, they marched forward with exultation at every step. Auspicious omens greeted them as soon as they stepped forward. Sita too at Ashoka Garden sensed auspiciousness that very moment. And, Ravana was beset by ominous forebodings indicated by inauspicious happenings. Jambuvan and others plucked huge trees and waved them as arms; they raised such war cries on their way that the earth shook under their feet and the skies rumbled all around. Off and on, they cheered, "Victory to Lord Ramachandra". In Lanka every Rakshasa was struck with anxiety about what was in store for him in days to come. They were afraid of the disaster that was imminent; they were convinced they could not escape the calamity. They could communicate their fears to each other only in whispers, since they were mortally afraid of Ravana. Wherever groups of Rakshasas collected in Lanka the talk centered round the calamitous damage inflicted by the messenger of Rama. They wondered, "When the servant is capable of such tremendous heroism, what would be the measure of the onslaught the Master can inflict!' They pictured Rama as capable of immeasurable attack. Their fears were communicated by her maids to Mandodari, the Queen of Ravana. Her mind was filled with apprehension and anxiety. She realized that the fear was based on a correct estimate of the happenings. She waited for a propitious moment when Ravana would be in a receptive mood, and could be spoken to while alone. Getting such a chance, she said, "Lord! Do not develop enmity with the Omniscient One. You have yourselves expressed the opinion that Rama is not an ordinary person. Your army could not wreak vengeance when sister Surpanakha was disfigured; it could not harm him or move him to repentance. Now, he has with him millions of redoubtable Vanara heroes. What can our Rakshasa warriors achieve against him now? They could not even bind and punish the messenger who got entry into this kingdom. That is the extent of the misfortune that has beset us. When one servant caused such horror and despair, how much worse would be the calamities that millions like him could bring about? Therefore, pray listen to my appeal. Send Sita back to Rama, in the care of brother Vibhishana, or with your Ministers. Sita too is no ordinary woman. She is exemplarily chaste; she is the very embodiment of spiritual energy that results from the righteous nature. Causing grief to such a person can bring you no good. Accede to my pleading. Return Sita to Rama. When that is done, all will be good for you and for our Rakshasa race. Or else, as the serpent swallows frogs, the arrows of Rama will swallow the Rakshasa hordes. Give up stubbornness and pride. Offer Sita at the feet of Rama". She fell at the feet of Ravana with this pitiable importunity. Ravana, the conceited ignoramus, looked at Mandodari, and replied with a loud peal of laughter. He said, "Fie on you! Tender women are scared soon; that is their very nature. Their words rising from fear will turn even fortune into misfortune. When the monkeys arrive at our doors, the Rakshasas would certainly gobble them up. The gods shudder in mortal terror when my name is uttered within hearing; why are you afraid of these tree-dwelling brutes? Fie on your fears! Get thee gone from here". Saying thus, he proudly moved into the Hall, appearing like personified audacity. As soon as he left, Mandodari bewailed to herself, "Alas! Destiny is devising a mighty tragedy. What has it decided for me? It is terrible even to guess what it is". Burdened with grief and at a loss to plan what else to do, she resorted to her rooms and rolled on her bed, agitated by a multitude of thoughts. At the Audience Hall, Ravana called the ministers together, and invited them to give expression to their estimate of the situation. "You are aware of the calamities that were inflicted by that messenger of Rama. What preparations are necessary? What are your suggestions for the future? Tell me quite frankly, without the slightest fear". The ministers looked at each other; they sneered in repressed laughter; but, no one dared speak. Suddenly, Kumbhakarna, immersed in sleep for months, and who was therefore unaware of the conflagration at the time of the visit of Hanuman, emerged from his sleep and rushed into the Audience Hall. He shouted at his elder brother, "Hello! You boasted that there is no hero equal to you in all the three worlds; you challenged the worlds and dared any one to face you. And, now I hear a tiny little monkey entered the City and burnt it to ashes! Shame! Shame on you! How did you allow it to escape alive?" With these words of jeer, he left the hall, and hastened home. At this point, Minister Atikaya rose from his seat and addressed the Emperor thus: "Master! We shall obey your commands. If only we have a gracious look from your eyes falling on us, we can destroy all men and monkeys and wipe them out of the face of the earth. Why assert more?" He sat down with a grunt of satisfaction. Then, Meghanada, the general endowed with the power of adopting any form he likes, rose to speak. "Supreme Master!" he said, "Your might and majesty resound all over the world. The gods are your bondsmen. Why should we speak of the fate of men in your Presence? For who can be stronger than these gods?" His words were soaked in pompous pride. The atheistic sons of Kumbhakarna, the highly egotistic brothers, Kumbha and Nikumbha also spoke in the same strain. Akampana and other warriors also added their tunes to the same song. Off and on, the irrepressible Mahodara stood up and rapped his thighs as if he was proclaiming his eagerness to join the fray. Of course, every one of them was infected with an inner fear, though they did not exhibit it in their speech or their countenances. The result was that Ravana was rendered happy, and their aim to hearten him was realized. Lastly, one Rakshasa rose and tried to catch attention. He said, "Emperor! I shall dress myself as a Brahmin, and approach Rama and Lakshmana wherever they are. I shall invite them for lunch and, when they come into my hermitage, I shall bind them hand and foot. If you approve of this stratagem, I shall attempt it". Ravana was very pleased with his ministers and others. Meanwhile, Vibhishana had entered the Hall. Ravana looked at him and asked him, "Brother! What is your opinion on this question: these men and monkeys?" Vibhishana replied: "Most compassionate brother! I shall answer as best I can, without any frills or feints. I only pray that you listen patiently and carefully. Pardon me, O Sovereign Lord! If you desire a good status after death, an unsullied fame while alive, prosperity and happiness here and hereafter, you must desist from admiring the beauty of women who belong to others. What can one single living being like you do, to injure or obstruct the Ruler of the Fourteen Worlds? Can any one survive after opposing Him? How can such a one prosper? Greed clouds all the virtues of a person. Lust and anger are gateways to the regions of ruin. Rama is not an ordinary person. He is Death to the God of Death. He is the regulator of Time. He cannot be affected by illness or want or weakness. He is unborn and so, immortal. Give up your hatred of such a Divine Person, and pray to be accepted as His servant. Return his consort to Him and earn His Grace. I am falling at your feet and pleading with you with all the force I command". Hearing him, Malyavantha, an old and revered Minister, nodded in agreement; he stood up and spoke thus: "Master! The words spoken by your brother are just and right. Accepting his suggestions will redound to your renown". But, Ravana was greatly incensed at the advice given by them both. He reprimanded them hotly. He said, "You are both fools! Do you know what you have been doing so long? You were extolling my enemy. You are not fit to be present in this Hall, while this subject is being considered". He ordered that they be removed from the Hall. At this, Malyavantha got down from his chair and hurried home, Vibhishana too offered his prostrations to his elder brother and, with folded palms, he expostulated, "O King! The Vedas and Sastras declare that in every person's heart there resides the twin natures of goodness and wickedness. When goodness predominates and is given full authority, the person will possess joy, peace and prosperity of all types. When wickedness predominates and is given full authority the person will be attacked by all types of adversity. Now, the vile nature is overwhelming your virtuous nature; so, you condemn as enemies those who offer good advice and try to promote your good. Sita is like the Night of Destruction for the Rakshasas. And, you have no compassion towards her. That is the wicked trait in you. I am praying for this boon from you: Please agree to my request. Return Sita to Rama. I am sure that will endow you with all happiness and auspiciousness". At this, Ravana rose suddenly from his throne and exclaimed: "Fool! Death has drawn very near you. You could be alive till this moment only on account of my grace. Now you are counting my enemies as your benefactors. I cannot understand why you have developed respect and loyalty to them. Is there on earth any one living who cannot be subdued by the strength of my shoulders? Eating the food I give, living in the house provided by me, residing in my territory, how dare you extol my enemies? Thorny bushes grown to protect the fort have become harmful to the fort itself. You have spread too much to be useful. Go, go to some hermitage and teach your lessons on morality and goodness". Thus saying, he pushed Vibhishana at his feet away from him with a kick. However angrily he was kicked, Vibhishana persisted long in praying to him, his hands holding the very feet that were kicking him. "King! Rama resolves on Truth and his resolution can never fail. Your time is running out; so too, the time of your followers. I am going to take refuge with Rama. I have done my best to save you. I have nothing to repent for; I have not done any wrong". With these words, he left the Hall. Reciting with every breath Rama Rama, and breathless with joy and excitement, he crossed the sea and landed on the other shore. The Vanaras who noticed him took him to be a messenger from Ravana, and they reported the arrival to their Ruler, Sugriva. Vibhishana was prevented from entering the camp. And the information was conveyed to the Lord thus: "O Rama! The brother of Ravana has come to have your Darsan." Rama asked Sugriva, who brought him the news, what he thought about the incident. Sugriva replied that it was difficult to understand the plans and purposes of Rakshasas since they assume various forms as and when they like and so are inexplicable. We do not know why he has come among us. I guess it is to open a wedge between me and Angada, the son of Vali. I believe it is advisable to bind him and keep him aside, without delay." Rama replied, "Friend! Your words are correct. You spoke in accordance with the injunctions in the Sastras about defections. Yet, listen to my vow. It may be opposed to your advice. My vow is to protect all those who surrender to me. Even if the person surrendering is our enemy, to make an exception in his case is wrong. I shall not give up any being that surrenders to me, even if it involves the sin of slaying a billion Brahmins. Maybe he has been sent by Ravana in order to sow the seeds of dissension among us. Well why should we be afraid of him even if this be true? Or he has come frightened by his brother, if he surrenders to me, I shall guard him and foster him as my own lifebreath. Therefore, bring him in, quickly," he ordered and Sugriva hastened to obey. Hanuman hastened to him and in an instant, made him stand before Rama. When his eyes fell on the Lotus Face of Rama, Vibhishana shed profuse tears of ecstasy. He could scarce stand erect. "Lord", he gasped, and fell at the feet of Rama. "Save me, save me. I am your slave", he prayed. "O Protector of the Gods! I took birth in the Rakshasa race; I am the younger brother of Ravana, who rules over the Rakshasas. My name is Vibhishana. My birth as a Rakshasa is the result of the vast quantity of sin I had accumulated. Dullness and ignorance have mastery over me. As the owl craves for night, I relish only darkness. You foster all those who surrender to you yearning for your love and grace. I have none else to whom I can run for rescue". Rama saw him pleading so humbly and so earnestly for being taken into confidence and saved and he was delighted. He drew him near, and softly fondled him, patting his back in deep love. He spoke sweetly to him, and said, "My dear Vibhishana! Do not worry. The very Darsan you had of me has destroyed the Rakshasa nature in you. You are to me as close as Lakshmana and Sugriva". These words wiped away all fear from the heart of Vibhishana. Then, Rama said, "O Ruler of Lanka! Are all your followers and companions hale and hearty? How were you passing your days right in the midst of many million Rakshasas? How were you able to maintain your devotion and dedication to God in that environment?" He also enquired of him various matters relating to his activities. At the end, Vibhishana said, "O Lord of the Raghu Dynasty! Lust, anger and the rest of that evil brood will infest the heart until the moment you enter it, with the bow and arrow in your hand; when your nature and your loveliness are known, they flee from the mind. Attachments and hatreds infest the dark hearts that know not the light of wisdom. Lord! I have earned the fruition of dearest dreams when I could cast my eyes on your Lotus Feet and touch them with my hands and head. My fear and sorrow have been destroyed. I have not done a single good deed any day; but, yet you embraced me. O, how great is my good fortune!" From Vibhishana's eyes, tears flowed in streams; they were tears of joy and gratitude. Rama intercepted his words and said, "Vibhishana! You possess all desirable excellences. Or else, you would not have earned this Darsan, this chance to touch me and contact me, and this opportunity to converse with me." At this, Vibhishana was thrilled with unbounded joy. He fell at the Lotus Feet of Rama again and again. Rama told him, "go, have a bath in the sacred waters of the sea, and come soon." Accordingly, Vibhishana left for the seashore. Rama asked Hanuman to bring from the sea a pot of the sacred water. When Vibhishana prostrated at the Feet of Rama, after the bath, Rama took a handful of water from the pot that Hanuman had brought and, sprinkling the drops on Vibhishana's head, he declared, "I am making you by this rite the Ruler of the Kingdom of Lanka." Vibhishana rose and said, "O Lord! Why do I need a kingdom? 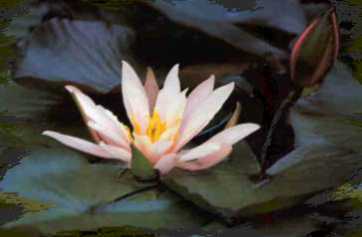 I am content if I secure a place by the side of these Lotus Feet". But, Rama said, "No. You cannot escape this duty". Vibhishana replied, "I bow my head to the command I receive from you". He folded his hands in prayerful humility. The Vanaras stood all around, struck by the compassion and grace that Rama bestowed on the person who surrendered his all at His Lotus Feet. Their hearts were filled with Bliss. Rama saw the Generals of Vanara hordes and spoke to them. "Leaders! Take this Vibhishana with you. Do not consider him as some one apart; regard him as your comrade. He is My own". These endearing words greatly heartened Vibhishana. Soon, they moved towards the seashore.